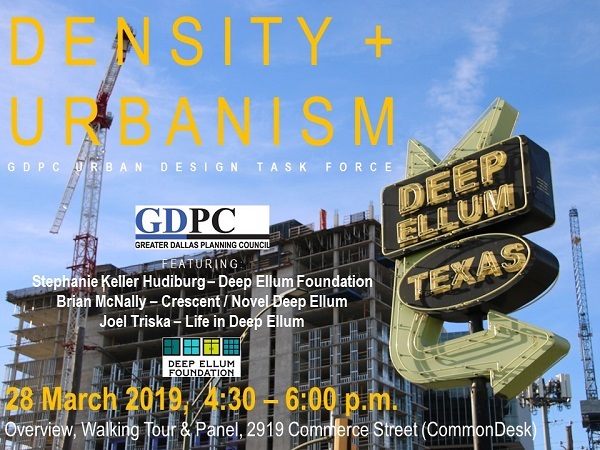 Details: Our Density + Urbanism meeting on March 28th will focus on issues and strategies from the perspectives of the Deep Ellum Foundation Executive Director, private development and neighborhood representatives. This will include an overview of current conditions, a brief walking tour and panel discussion. The following individuals will be featured: Stephanie Keller Hudiburg - Deep Ellum Foundation; Brian McNally - Crescent / Novel Deep Ellum; and Joel Triska - Life in Deep Ellum. A final stop at a local brewery is optional. Participation is free. Join us!